Erik Erikson was a German-born American developmental psychologist and psychoanalyst known for his theory on psychosocial development of human beings. Erikson was born on June 15, 1902, in Frankfurt, Germany, of Danish parents. The common story was that his mother and father had separated before his birth, but the closely guarded fact was that he was his mother's child from an extramarital union. He never saw his birth father or his mother's first husband. When he was 3, his mother was married to his pediatrician, Dr. Theodore Homburger, and throughout his youth he was known as Erik Homburger. He did not learn about his parentage until his teen-age years, "and it was a secret my mother and I shared," (NY Times, 1994). Adding to the confusion, his adoptive father was Jewish and his mother's heritage was Lutheran. With his analysis complete by 1933 and his formal training in psychoanalysis also finished, Erikson left Vienna for the United States. He had a presentiment, he said, of the Nazi terror that was about to descend on Europe, and he was restive about developments in Freudianism, in which Freud's theories were being hardened into beliefs, "and the whole thing was becoming creedal," (NY Times, 1994). Erik Erikson was a friend and disciple of Sigmund Freud. Mr. Erikson’s ideas had effects far beyond psychoanalysis, shaping the emerging fields of child development and life-span studies and reaching into the humanities. He was best known for the theory that each stage of life, from infancy on, is associated with a specific psychological struggle that contributes to a major aspect of personality. Erik Erikson was a friend and disciple of Sigmund Freud. Erikson’s ideas had effects far beyond psychoanalysis, shaping the emerging fields of child development and life-span studies and reaching into the humanities. He was best known for the theory that each stage of life, from infancy on, is associated with a specific psychological struggle that contributes to a major aspect of personality. Basic trust vs. basic mistrust (Infancy - 0-1 year of age): Whether or not the baby develops basic trust or basic mistrust is not merely a matter of nurture, it is multi-faceted and has strong social components. The mother carries out and reflects their inner perceptions of trustworthiness, a sense of personal meaning, etc. on the child. If successful in this, the baby develops a sense of trust which “forms the basis in the child for a sense of identity. Autonomy vs. Shame (Early childhood): Introduces the concept of autonomy vs. shame and doubt. During this stage the child is trying to master toilet training. Purpose - Initiative vs. Guilt (Preschool / 3–6 years): Does the child have the ability to do things on their own, such as dress him or herself? If "guilty" about making his or her own choices, the child will not function well. Erikson has a positive outlook on this stage, saying that most guilt is quickly compensated by a sense of accomplishment. Competence - Industry vs. Inferiority (School-age / 6-11): Child comparing self worth to others (such as in a classroom environment). Child can recognize major disparities in personal abilities relative to other children. Erikson places some emphasis on the teacher, who should ensure that children do not feel inferior. 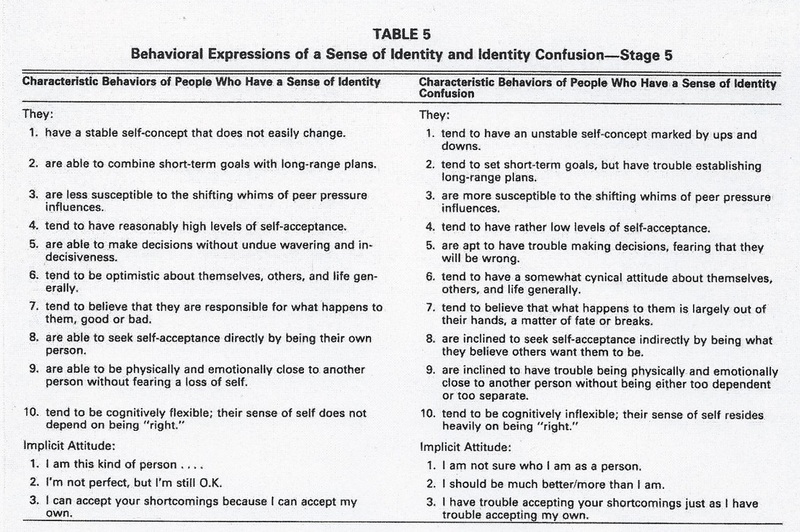 Fidelity - Identity vs. Role Confusion (Adolescent / 12 years till 20): Questioning of self. Who am I, how do I fit in? Where am I going in life? Erikson believes that if the parents allow the child to explore, they will conclude their own identity. However, if the parents continually push him/her to conform to their views, the teen will face identity confusion. Intimacy vs. Isolation (First stage of adult development / 20 to 24): Dating, marriage, family and friendships are important during this stage in their life. By successfully forming loving relationships with other people, individuals are able to experience love and intimacy. Those who fail to form lasting relationships may feel isolated and alone. Generativity vs. Stagnation (Second stage of adulthood / 25-64): During this time, people are normally settled in their life and know what is important to them. A person is either making progress in their career or treading lightly in their career and unsure about if this is what they want to do for the rest of their working lives. Also during this time, a person is enjoying raising their children and participating in activities that gives them a sense of purpose. If a person is not comfortable with the way their life is progressing, they're usually regretful about the decisions and feel a sense of uselessness. 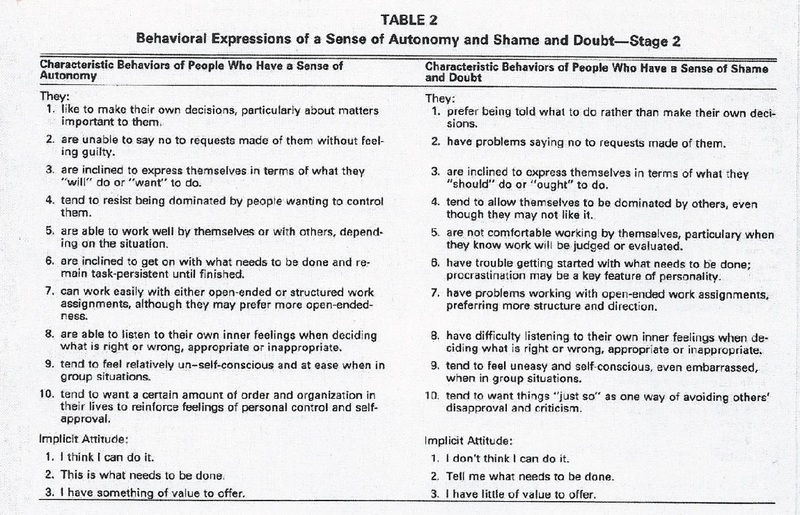 In April of 1988, Professor Don Hamachek, of Michigan State University, published an article in the Journal of Counseling ad Development in which he created a set of criteria developed within Erikson’s first five psychosocial stages that would help in evaluating self-concept and ego development. 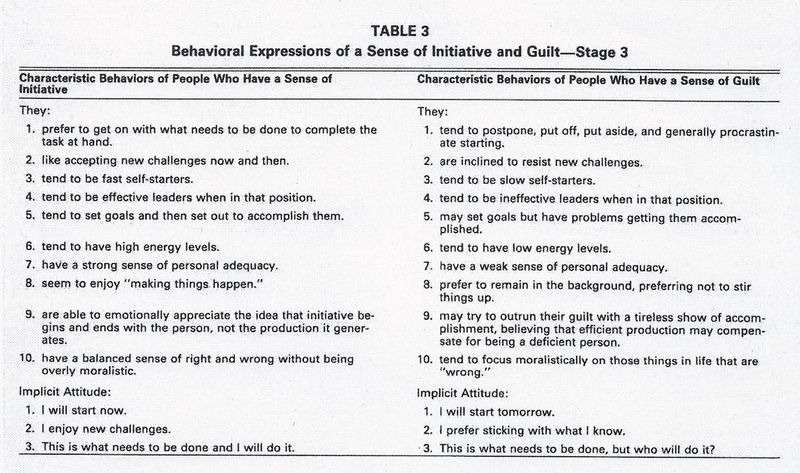 In his article, Professor Hamachek points out the weaknesses in Erickson’s stages of development, which is a lack of criteria about what behaviors to look for during each stage that would allow one to evaluate the status of a person’s progress through these stages. 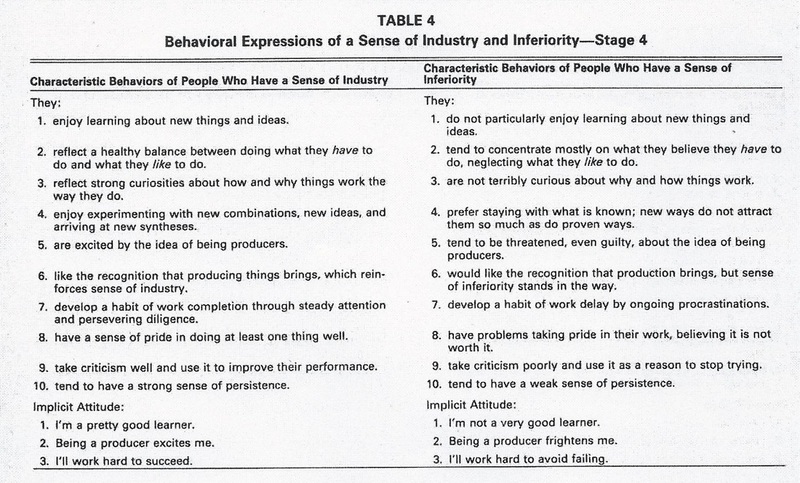 The article includes five tables with ten characteristics for each of the two parts of the five stages (i.e. 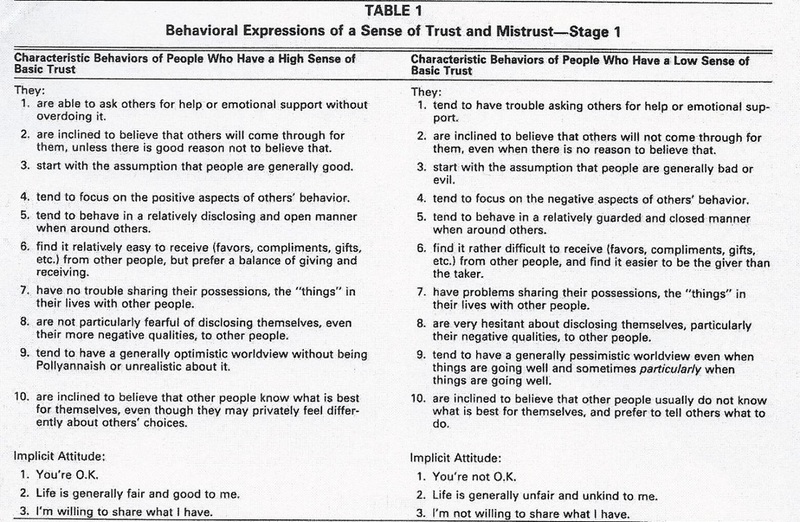 ten characteristics for Trust and ten for Mistrust in Stage 1). In the development of these criteria Professor Hamachek cautions that both these criteria and Erikson’s stages of development are “highlighting expressions of behavior that are likely to be associated with positive and negative ego development” (Hamachek, p. 360). The criteria presented in this article may not be crucial in the development of all people the same way, and they need to be tested and researched. Hamachek, D. E. (1988, April). Evaluating Self-Concept and Ego Develpoment Within Erikson's Psychosocial Framework: A Formulation. Journal of Counseling and Development, 66, 354-360.